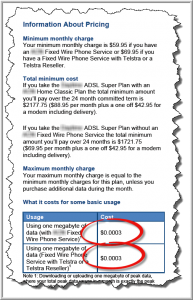 Every day, it seems more telcos are releasing a Critical Information Summary or CIS. The early adopters are to be applauded for taking a lead, even though some are making mistakes along the way. The latest CIS we’ve come across gets a lot right, but a few things wrong or doubtful. the order of the headings and the information. 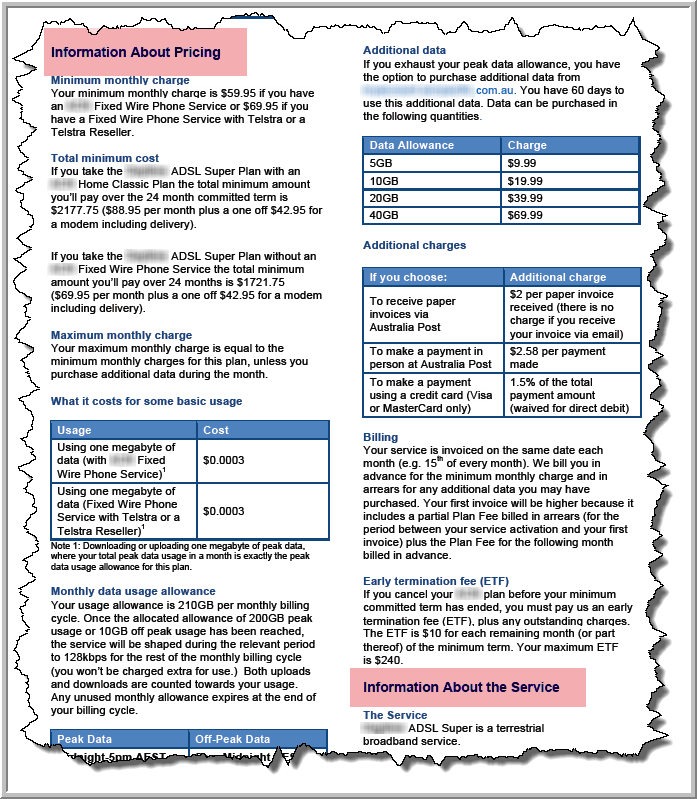 Simply, you don’t have the option of putting the ‘Information about pricing’ section before the ‘Information about the service’. 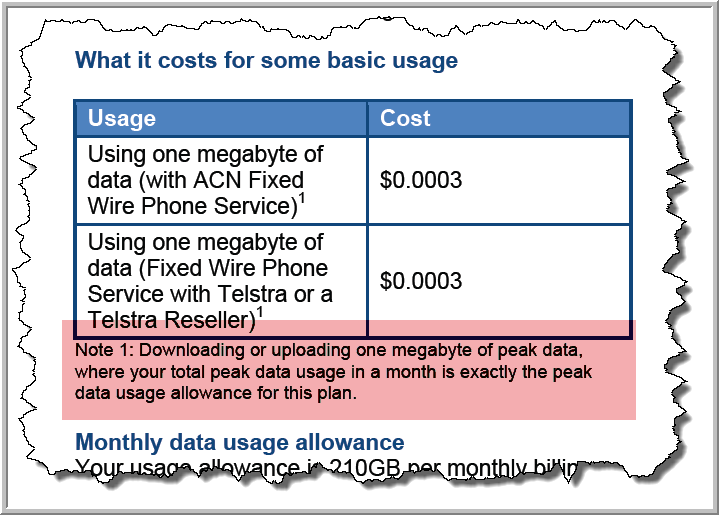 You have to feel sorry for both telco and consumer here. After all, who can make much sense of prices quoted to the fourth decimal place? But since the TCP Code requires that unit cost be calculated per MB, that’s what the telco had to do. The problem is that they actually needed to quote the unit price to at least five decimal places, or the result is misleading when it comes to the comparison between the two ‘flavours’ of the plan. One plan option is in fact 16.6% more expensive than the other, but when you round them both to just four decimal places that significant difference (apparently) disappears. Suddenly, both versions ‘cost’ exactly the same. In one sense, you can’t blame the telco for this. 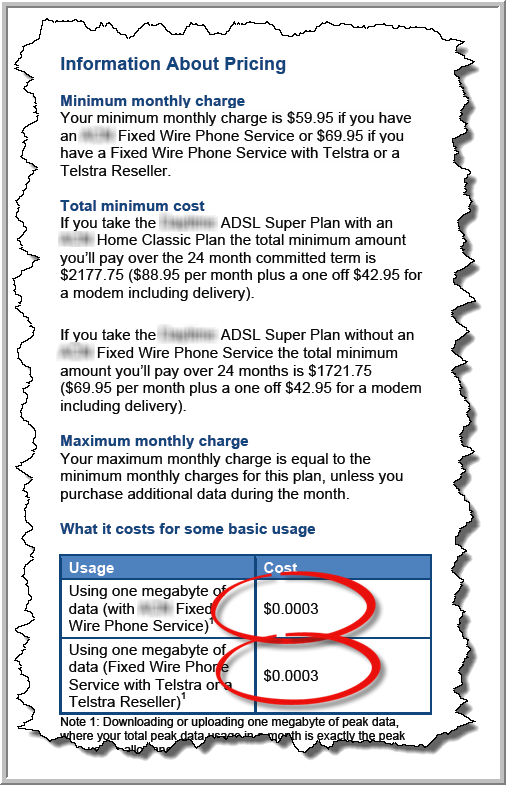 The unit pricing rules insist that a per MB cost is quoted, even though that leads to ludicrously small figures when high volume DSL or fibre plans are involved. 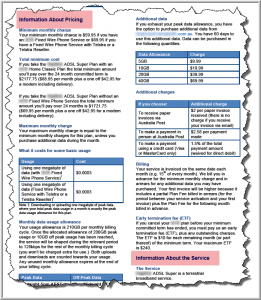 But one thing is clear: If quoted unit pricing indicates that a $59.95 plan costs the same as a $69.95 plan, something is wrong. 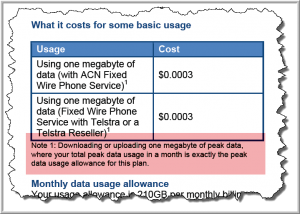 downloading or uploading one megabyte of peak data, where your total peak data usage in a month is exactly the peak data usage allowance for this plan. That’s really well intentioned, but quite unnecessary. The TCP Code is based on the presumption that unit price is equal to the plan fee divided by the included MBs. It’s not necessary (or helpful, really) to add a note like this, explaining that the cost is based on the assumption the customer will use their entire allowance. To make the new Critical Information Statement really useful, telcos need to be careful to closely follow the TCP Code rules. But they also need to think carefully about every aspect of the CIS and the information it conveys. This entry was posted in Advertising, Critical Information Summary, Sales, Unit Pricing Rules and tagged advertisements, CIS, Critical Information Summary, unit pricing. Bookmark the permalink.